The Merengues have temporarily reduced distances to Barcelona in La Liga, after winning by 2-3 in Valladolid this Saturday night. Karim Benzema and Mesut Ozil with two goals, helped Real Madrid getting past the local side, keeping alive the hopes of still revalidating the Spanish League title this season. Every away game in La Liga this season seems to be a very tough battle for Real Madrid. In a visit to Valladolid, José Mourinho's men allowed the opposite side to take the lead twice and in both occasions, they have conceded the goals from corner kicks. Fortunately for Real Madrid, there was a man particularly inspired this Saturday night, who goes by the name of Mesut Ozil. The German midfielder late 1st half goal comes from a simply superb play and allowed the Spanish champions to approach the 2nd half with a more patient game plan. 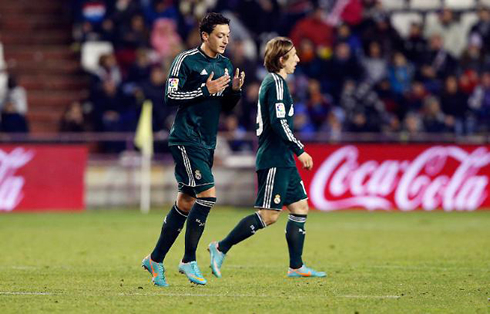 With less than 20 minutes for the final whistle, Ozil emerged again and scored the winning goal from a brilliant free-kick near Valladolid's penalty area. The Merengues have cut the gap to Barcelona into 8 points and will now have to wait for their rivals' league game against Betis, scheduled for this Sunday night. But before that game in Sevilla tomorrow night, we'll all be able to watch another exciting game live online from the Barclays English Premier League, with the Manchester City v Manchester United derby game taking place at the Etihad Stadium. No one will surely argue if we simply start by pointing out that Real Madrid keeps struggling when it comes to defend from set-pieces. Tonight's game against Valladolid is just one of many in this year's campaign where the Merengues ended up conceding goals from either corners or free-kicks, and which could have very well led to a negative result. Real Madrid has allowed 12 goals in La Liga so far, with 6 of those (50%) coming from set-pieces plays. Despite José Mourinho's multiple attempts of fixing this serious flaw on his team, the truth is that we keep seeing several mistakes being made and opponents will most likely continue capitalizing until significant improvements are made, in terms of focus as well as aggressiveness levels when attacking the ball. 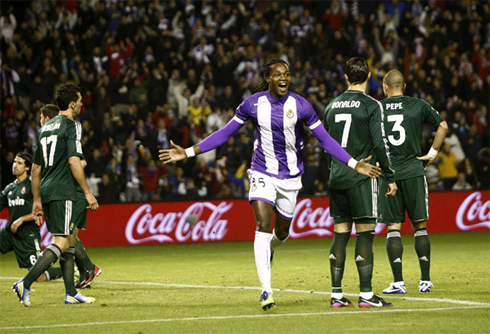 The first blow happened at the 6th minute of the game, in a Valladolid's corner kick at the left attacking side. Ebert made a cross which in a first instance was poorly cleared by Real Madrid players and ended up bouncing in front of Manucho. The Angolan striker was completely unmarked and easily striked the ball to his left side, beating Iker Casillas for the first time on the night. The nightmares of several recent away losses in the league have certainly started popping in many Real Madrid players' heads, but luckily, shortly after the home side reached the game opener, Karim Benzema responded with the equalizer. Valladolid made a big mistake in their defense, as Marc Valiente slipped in a forbidden area and allowed Callejón to easily enter the penalty area with the ball well controlled. 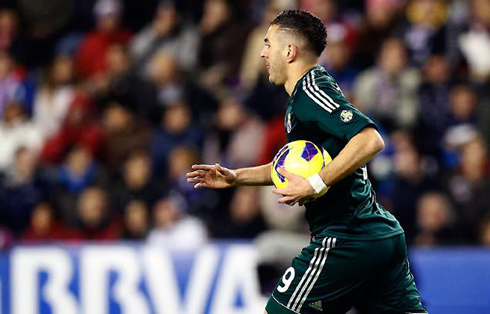 The Spanish winger spotted Karim Benzema showing up in the middle and without any defender near him. He quickly drove a low pass and assisted the Frenchman for an easy tap-in that has put things even once again. Valladolid would return to the lead just a few minutes later and right after earning another corner on the left. We were playing the 21st minute of the 1st half, but what happened next was like some sort of a "dejà-vu". Ebert took the corner again and who else but Manucho to win in the air and head the ball to the back of Real Madrid's net. The Angolan's height of 1.87m (6ft, 2in) was determinant, but what stood out the most was the poor marking from Sergio Ramos, who seems to have forgotten the basics as he tried to mark Manucho on his back. Iker Casillas also didn't didn't attempt to go meet the cross, which may also be pointed as a mistake since the ball was headed by the "Palanca Negra" just 2 meters ahead of the Merengues goal line. Aside of Mesut Ozil and Callejón excellent individual displays this Saturday night, José Mourinho has surely good reasons to be happy with the way his team reacted to the two disadvantages in the scoreline. The frustration didn't get the best out of the Merengues players and a new equalizer took place in a key moment of the game, as half-time was just around the corner. Mesut Ozil picked up the ball on the right, ran with it close to his left foot during a few seconds as he left several opponents behind, passed it to Karim Benzema who was already inside the area and saw the ball being returned from a terrific backheel touch. With only the goalkeeper in front of him, Mesut Ozil made the ball get past under Dani Hernández's body and restored the equalizer on the 44th minute of the game. Everything was possible in the 2nd half, but even though Real Madrid found himself with 45 minutes left to chase a single goal that could give them the 3 points they were striving for, José Mourinho didn't lose much time to take some risks and brought in Angel Di María as a replacement for Nacho, surprisingly dropping Callejón into the left-back position. Later in the game, it would be the time to replace Arbeloa for Modric, as Real Madrid couldn't afford to drop any point and Mourinho felt the need to risk everything with hopes of still reaching the winning goal. Mourinho's audacity paid off later on, but first, Real Madrid would still score a goal by Sergio Ramos that ended being mistakenly disallowed by the Spanish referee, Pérez Montero. The linesman raised his flag in a play where Sergio Ramos was clearly on-side, as he probably got tricked with several other Real Madrid players that were in front of his line of sight, and who were indeed offside but had no influence in that play. 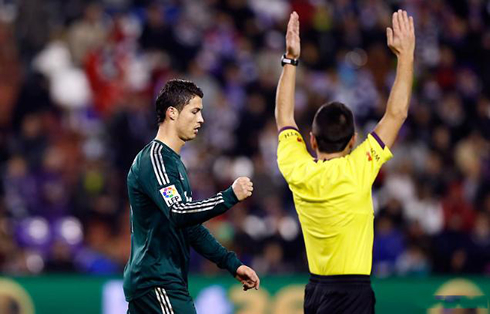 Nonetheless, the Merengues reached a valid third goal moments after, during the 71st minute of the game. Cristiano Ronaldo granted Mesut Ozil with an opportunity to take a free-kick near Valladolid's penalty area and the German ace responded in great style by scoring a marvellous free-kick. 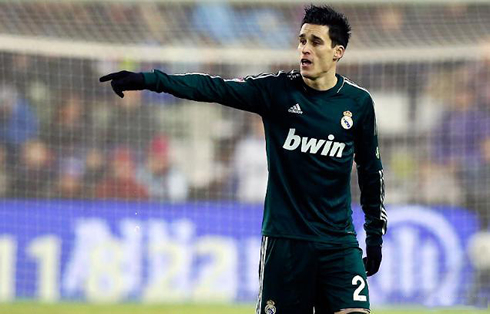 Dani Hernández had absolutely no chance to stop what was a very accurate shot and Real Madrid had gotten the lead for the first time on the night. José Mourinho immediatly made some tactical chances for his team to gain more defensive consistency and the Merengues managed to held on the one goal lead until the final whistle. Cristiano Ronaldo and every single Real Madrid fan will now wait for Barça's result tomorrow night against Betis, but earlier on, there will be a Manchester City vs Manchester United derby that no football fan can afford to miss. Cristiano Ronaldo next game for Real Madrid will be against Celta de Vigo, for the next round in the Spanish Copa del Rey, next Wednesday (December 12, 2012). You can watch Juventus live stream, Celta de Vigo vs Real Madrid, Betis vs Barcelona, Manchester City vs Manchester United live, Everton vs Tottenham and West Ham vs Liverpool, all matches provided from our soccer live section.